Just like many kids growing up my Dad was my hero. 30 years later, he still is. I always wanted to be like him, and know everything that he did. My Dad could fix that leaky pipe, build an addition on the house, and fix the family wagon. Naturally, I was his annoying shadow growing up, “helping” to make those projects take even longer. He was strong as an ox – a tough construction worker for over 35 years. Even in my adolescent teen years, where many teenagers seemingly know more than their parents, I always knew my Dad and Mom were speaking from experience and wouldn’t lead me the wrong way. He’s the reason I got into the car industry and learned how to turn a wrench – something I’m forever grateful for. For years now, my Dad has wanted a ‘55 Bel Air. He has the typical old-guy story, “I use to have one of those when I was in high school!” However just like all those old guys, he beat the hell out of it, put it in a ditch and left it and ended up selling it off before he knew better – a choice he’s regretted for years. 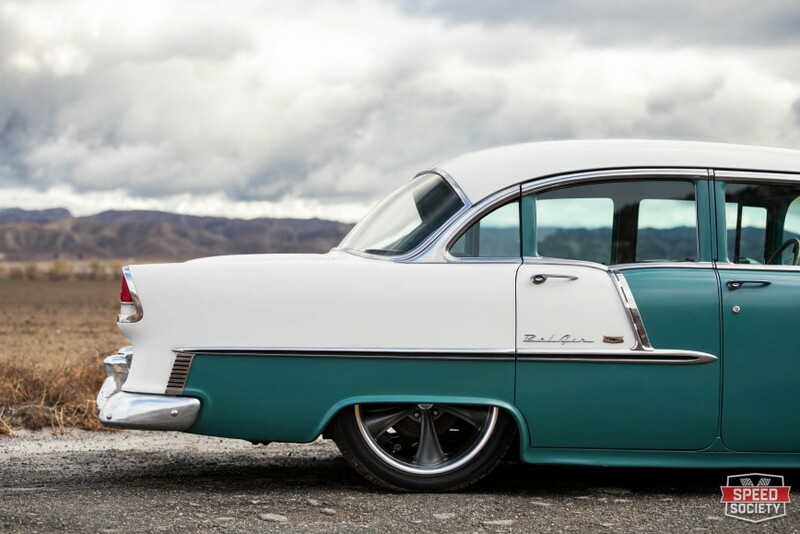 To make his desire worse, his older brother had a tricked out ‘55 in high school. His brother passed away at 18 years old, and to have another ‘55 would be a sort of memorial to his long lost brother, my Uncle Jeff King. The day we bought the car in San Marcos, CA not running or driving. After working in construction for 35 years my Dad’s health started to decline. He was having trouble breathing and had a host of other issues. The fix was supposed to be simple, go in, get three heart by-passes and get back to normal. After being in surgery much longer than anticipated, he came out with five by-passes. We all were shocked and breathed a sigh of relief, until an early morning phone call. “His heart is failing,” stated the doctor. While the doctor had my Dad’s chest split wide open, he noticed one of the heart valves was leaking, part of the original problem. He fixed it, or so he thought. In the middle of the night the heart began to fail, and my Dad went back in for emergency open heart surgery – the second in less than 24 hours. Nobody knew what the fate of that surgery would be, and we all stood on edge for hours. I was standing by as they wheeled him from recoverry into the ICU. This wasn’t my Dad. My father was big, strong, and healthy – nothing phased him. This person was a mere image of my Dad. A million tubes going in and out of him all over his body with tons of machines beeping away next to him. Instantly I couldn’t breathe, my eyes swelled, and I had to go outside and get some air before I passed out. Luckily, his strong will pulled him through. He lived to see my kids being born and continue to do what he loves – travel all over the USA with my Mom exploring every nook and cranny they can find. In the back of his mind, the desire to get his car from when he was 16 grew. On top of everything else, he wanted one as a tribute to his brother. 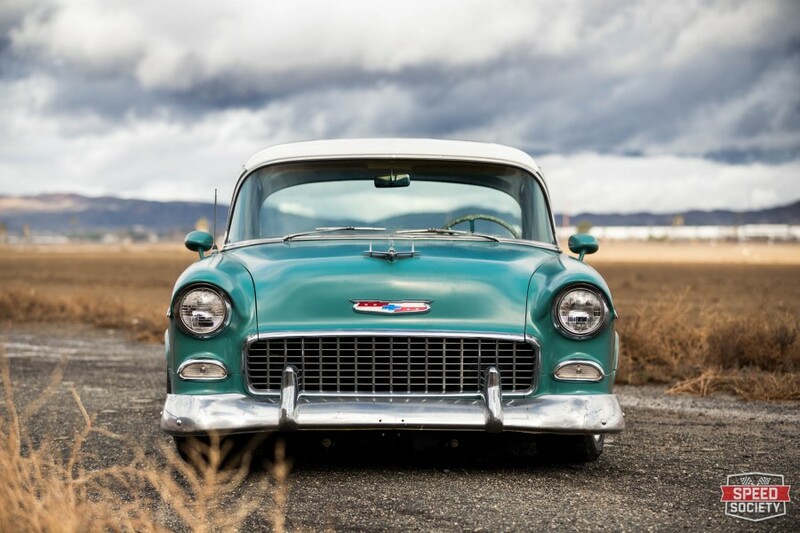 Since his surgery and retiring that desire for a Bel Air became almost unbearable for my Dad. Every week I’d talk to him and he would talk about getting one, showing me Craigslist and eBay ads. Unfortunately, every time he went to the bank, also known as my Mom, she would say, “Do you want to keep traveling or do you want a ‘55?” He always replied with “Both!” The plan was to travel for a few more years, sell off one of his motorhomes and his Jeep, then buy a ‘55. His dream was to get one that he could tinker on, fixing it up as he drove it daily. Even though he’s recovered quite well from his surgery, his strength isn’t what it use to be. I told him we need to find one that has a lot of the hard work finished, and he could just focus on little things there and there. My plan for a few years was to start saving up some pennies and buy my Dad his dream car. I had already started on that, but was still 3-5 years away from accomplishing just that. 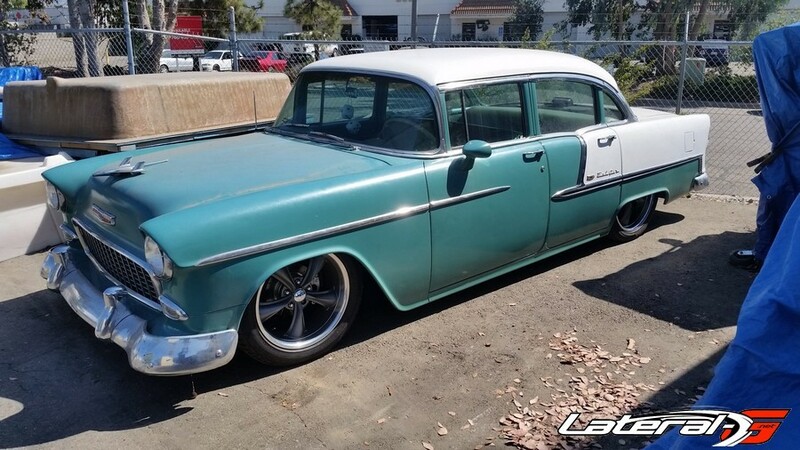 But just a little over a month ago, he found this particular ‘55 in San Marcos, California – an hour away from home. 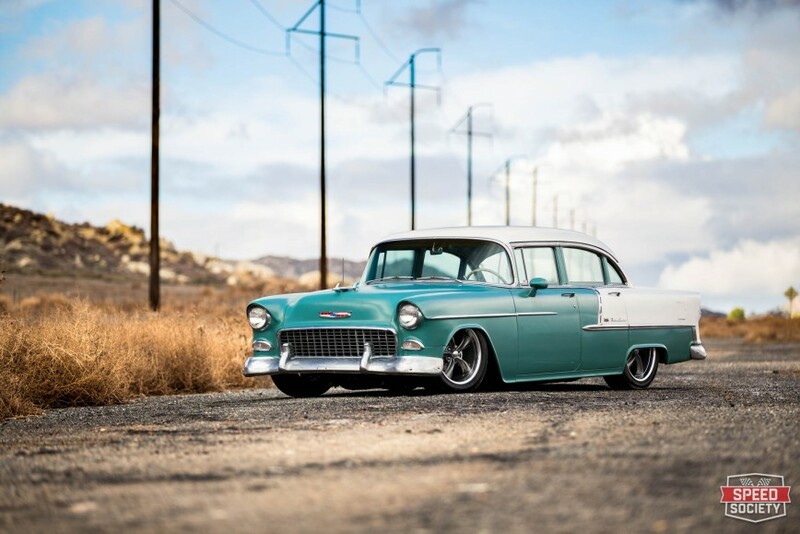 This ‘55 was exactly what he was looking for. 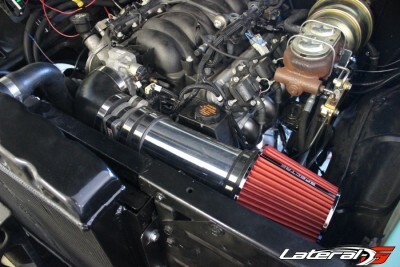 The owner had already swapped in an LS1 with the 4L60E transmission, minus some wiring. The front suspension and steering had already been rebuilt, upgraded to tubular control arms and disc brakes. 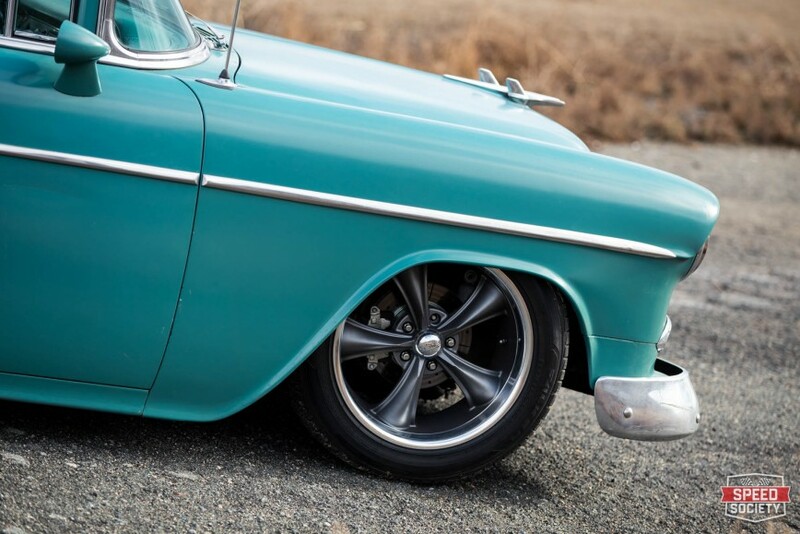 The factory rearend was rebuilt and a completely custom four-link suspension had been installed. He even spent the money and had a complete air bag suspension system installed on the car. By this point, the car was about 90% finished. But the owner had run out of patience for the car, knowing that he wouldn’t be able to touch it for another year. Instead of letting it sit, he decided to sell the car. Like they say, persistence pays off. After talking to my Mom about a ‘55 for years, he finally got the approval to get one. He calls me and tells me about this ‘55 in San Marcos, but needs me to look at it since he’s currently traveling for a month. With cash in hand, I head down and check out the ‘55. It’s everything the ad said it was, but better. The car was mainly original, but needing a full rewire and finishing up of some minor details. All the hard work was done. After loading the car up the trailer I called my Dad, and lied. I told him that the car was total junk and the seller’s’ story was all mixed up. With my plan in motion, I set out along with my brother and best friend to get the car running and driving before he got home. I let my Mom in on the plan, so we all had to lie to him for a month – no easy task to do. 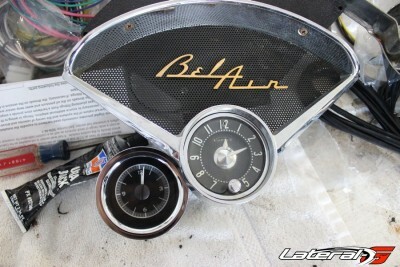 I even was setting up times for him and I to go look at another ‘55 when he got back. While the majority of the hard work had already been completed on the car, there was still a ton left to do in only a month’s time. To make matters worse, for 12 of the 30 days, I was out of town for work. What it boiled down to, I had only 10-12 days to get the car finished before he showed up. Luckily, some of the best in the industry stepped up to help me finish the car. I also had my buddy helping me, who’s a world class auto mechanic and fabricator along with my brother who helped turn a few wrenches. The first problem was the biggest issue, rewiring the entire car. Instead of dealing with 60 years of splices, new wires, and old wires, we bought a brand new wiring harness and started fresh. One of the next issues was gauges. 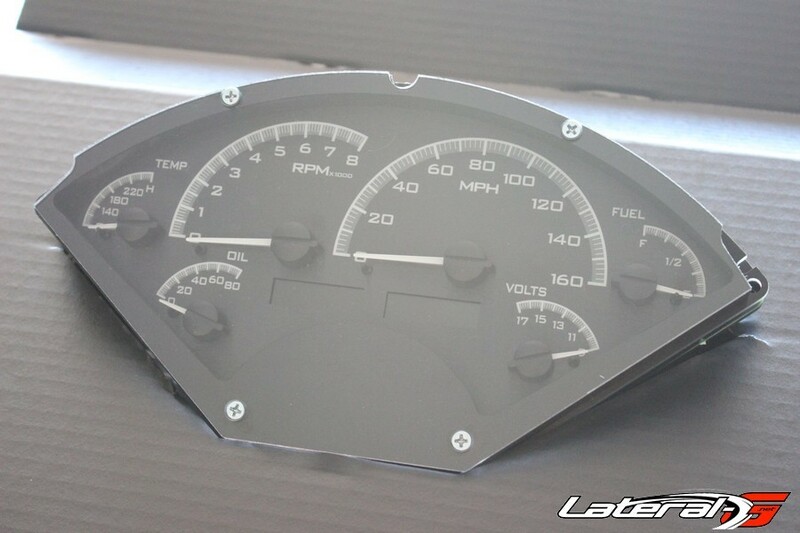 The factory gauges, even if they did work, weren’t going to be compatible with the new LS1. Knowing that my Dad loves the Dakota Digital VHX gauges I have in several of my cars, I called up Scott Johnson at Dakota Digital and explained to him the project. “That sounds like a great project. 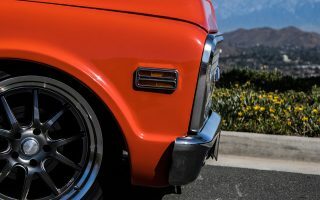 Our VHX line is the perfect fit, giving a classic yet modern look that will work perfectly with the upgraded motor and transmission,” explained Johnson. We also picked up one of their universal gear sending units, which displays the gear on the VHX display. 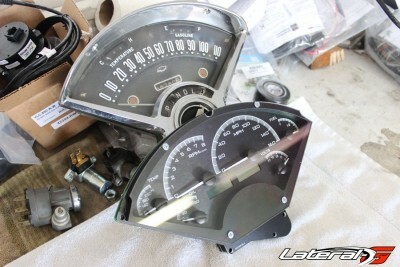 The installation of the VHX gauges is about as easy as it gets. To start, we popped out the factory gauge housing and gauges, which is only a few screws. 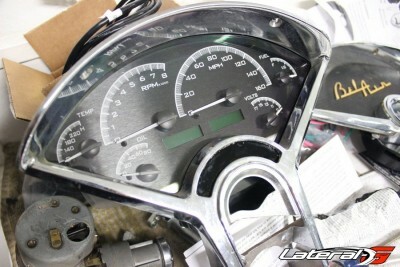 Then we unscrewed the gauges from the chrome housing, and screwed in the new VHX gauges in their place. Wiring up the gauges is almost as easy. The VHX gauges utilize a small computer, that connects to the gauges with a CAT 5 cable. While we were rewiring the entire car, we simply wired in this computer at the same time. 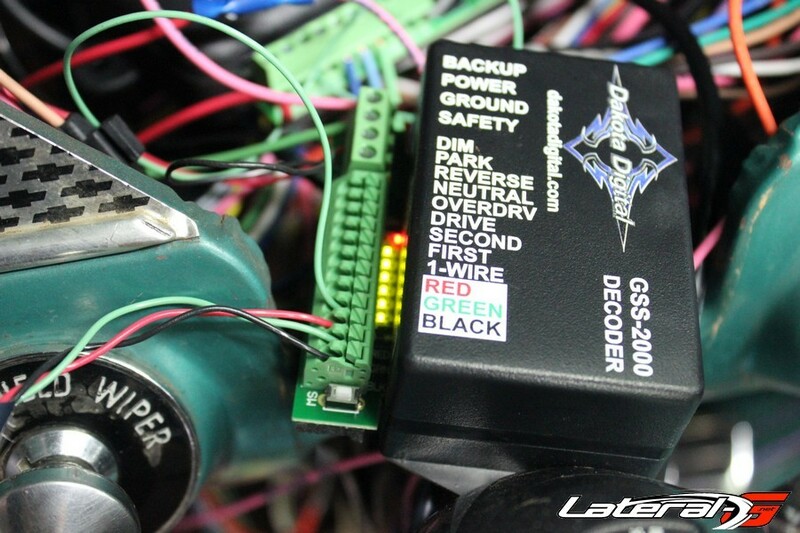 From the factory harness we utilized a few wires, such as hot, hot-in-run, turn signals, high beam, dimmer lights, etc. 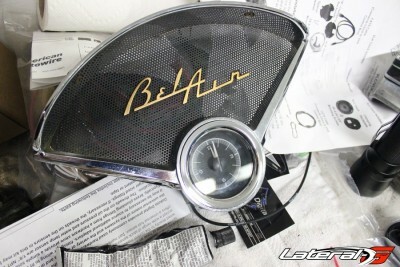 The tach signal was picked up from the LS wiring harness. From there we had to install a few sensors. On the motor we removed the factory LS oil sending unit, which is behind the intake, and screwed in the Dakota Digital sending unit. For temperature, we unscrewed the plug in the head on the passenger side, all the way in the back, and screwed in the Dakota Digital sending unit with the supplied adapter. Integrating a shift indicator to the VHX gauges. The last step was to install the gear sending unit. This unit just has to be mounted to the side of the transmission and can’t move the arm more than 180 degrees. Using the supplied brackets and rods, we had this installed in about a half hour. With the sending unit mounted, we ran the wires through the firewall into it’s own computer. This computer then has one wire that goes over to the gauge computer. Programming this gear sending unit is simple as well, with just shifting the transmission and pushing a few buttons. The one item we needed to make the entire electrical system work and function was a battery. We decided to mount the battery in the trunk, behind the spare tire. Instead of messing with a battery box and all that hassle, I decided to go with an Optima Red Top battery. This battery provides more than enough cranking amps for the motor, even all the way in the trunk, and doesn’t require a big ugly battery box. Finishing off things under the hood was fairly easy. My buddy fabricated a fan shroud, computer mount, and ran the transmission cooler lines. I was able to find radiator hoses to work on the LS swap, and my brother had the steam vent bung welded into the radiator. But one major item I needed to figure out was an air intake. This computer still utilized the MAF and IAT sensor as well. Instead of wasting time trying to find something that worked, I called up the experts at Spectre Performance and talked to our buddy Mike Morrow. “I have exactly what you need for this project, this is a pretty easy one,” Morrow told me. He was right too – a rubber elbow, straight piece of pipe, some rubber adapters, filter and hose clamps was it. 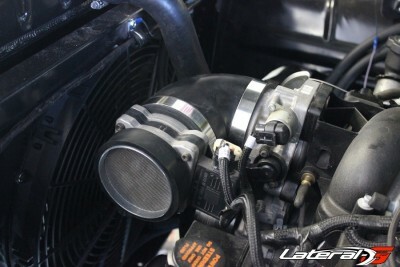 We started by installing the rubber 90-degree boot on the throttle body and holding up the aluminum tubing in place. We would have to cut it to fit, so we wanted to make sure to get it right. After trimming it down a few inches, we simply installed the MAF, then the filter on and tightened everything down. Now you you don’t want to leave the intake like this as it will flop around and eventually fail. Using one of Spectre’s brackets, we secured the intake to the core support. One of the finishing touches on the car was a cosmetic upgrade. Did we need to do it in order to drive the car down the road? Absolutely not. Did it drive us absolutely nuts? Yes. That was the gas and brake pedal. Now since this car wasn’t originally a cable drive throttle body car, the previous owner had already installed a Lokar cable. The problem was the gas pedal assembly itself. 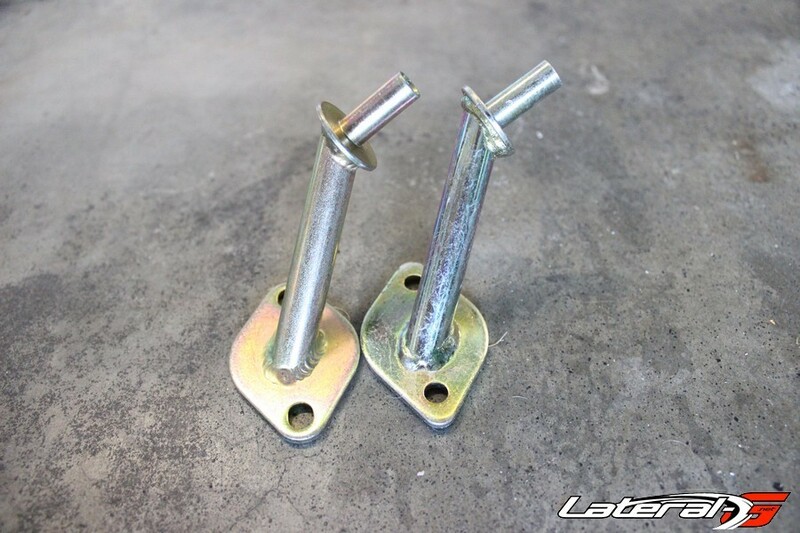 Right away we knew it wasn’t a quality Lokar piece as it didn’t have the same quality and most importantly, the angle of the pedal was extremely odd. The pedal wasn’t square and had a really funky arc to it. 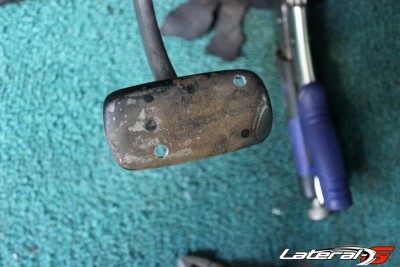 On top of that, the factory, worn out brake pedal pad looked horrible. I called up Lokar Performance and talked with Mike Waldo. 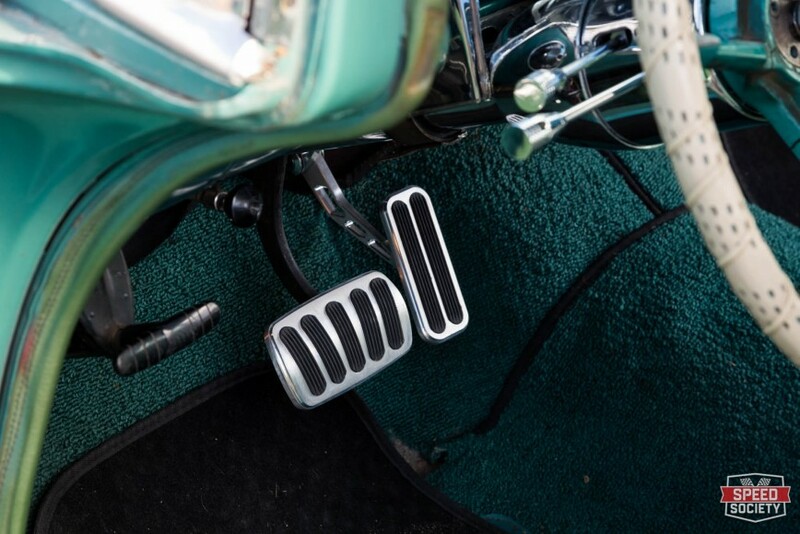 “We have a bolt-in gas pedal for the Tri-5 Chevy’s with a few different options for finish. 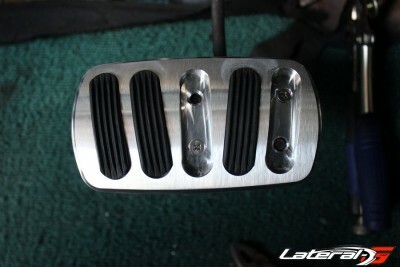 We also have brake pedal covers, that will match the gas pedal for a professional, quality finish,” stated Waldo. With that, I ordered up a new gas pedal and brake pedal cover. Starting with the gas pedal, we removed the assembly that was currently in there. Setting it against the Lokar piece, it was obviously a knock off. The welds weren’t as nice, the bushings were sub-par quality, the angle of the mounting bracket was completely wrong, and overall it had a cheap knock-off feel to it. Take note folks – it may save you a few dollars up front, but will those knock-off’s will cost you later on. Both look similar, but the counterfeit is on the right. After popping off the pedal and arms, I slid the mounting bracket from the engine side into the passenger compartment through the factory linkage hole. Reusing the two bolts, the hard part was finished. Mind you that the engine is installed in this car. Installing it was still possible, just a little harder to get the bolts installed since I could only move them a few degrees at a time. On the inside, we reinstalled the arms, adjusting them so that the pedal bottoms out on the floor, while the throttle body is wide open. This takes a few minutes of trial and error, but is easy to do. My OCD was happy when the pedal was square and the arc was correct. 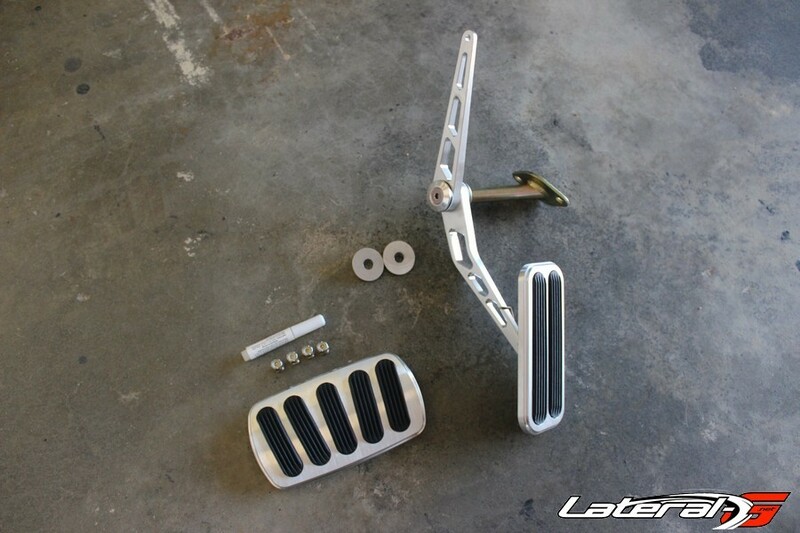 The brake pedal pad is even easier to install. I popped out the two rubber inserts, and set the pedal pad on the bare pedal. Using a sharpie marker, I marked the holes and drilled two opposing holes. Using the supplied bolts, I attached the pedal pad onto the pedal, then used the supplied super glue to firmly secure the rubber inserts. Just like that, we had killer looking pedals that will work even better than the factory set up. The very last step to get the car finished off was having some exhaust welded up. Instead of messing around, I took the car to a local muffler shop and had them bend and weld up a new exhaust, using the mufflers that came with the car. In a little over an hour the exhaust was finished. Now that the car was running and driving, I had two extra days before my Dad came home. I spent those catch up on sleep, along with getting the car cleaned. The anticipation was almost too much, everybody kept speculating on his reaction when he would open his garage and see the car sitting there. Like I mentioned before, my Dad’s a manly-man. I’m not sure I’ve ever seen him cry, and he doesn’t show a lot of emotions. Would this reveal be the time he cried? Would he laugh? We all had our theory, but we finally found out. The Monday he came home, we cleaned out his three car garage and all parked down the street. 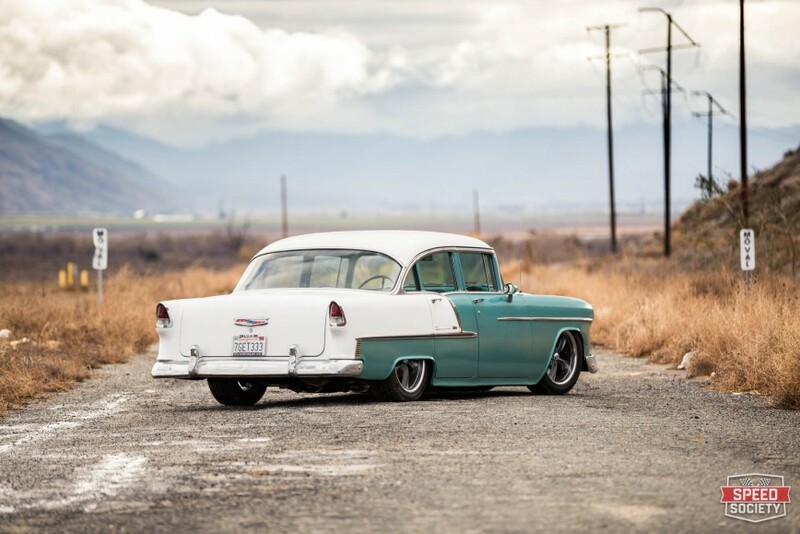 Sitting in the middle of his garage was his, unbeknownst to him, ‘55 Bel Air aired out and sitting on the ground. Finally the motorhome pulled in, and we could hear him and my Mom coming out. The garage door started to open and he looks inside. The moment he saw the car, he turns to my Mom and says “DID YOU KNOW ABOUT THIS?” With a big grin, she nodded and said “Happy Birthday!” We all started to laugh and he just kept saying, “I can’t believe this,” and “This is too much!” For the record, there were no tears, but his eyes did water up a bit. After admiring the car for an hour and seeing all the work that was completed on the car, I finally said “lets go around the block!” He smiled from ear to ear, and was still asking me questions about the car, trying to grasp what I had done for him. He got on the throttle about halfway and was blown away at how fast the car was. After beating the car up a bit before handing over the keys, I knew the car was even faster than that! I know that night he didn’t sleep much that night. He had to get up and go look in the garage to make sure the car was still there. Since giving him the keys, he’s driven the car every single day, which was his goal – a daily driver. 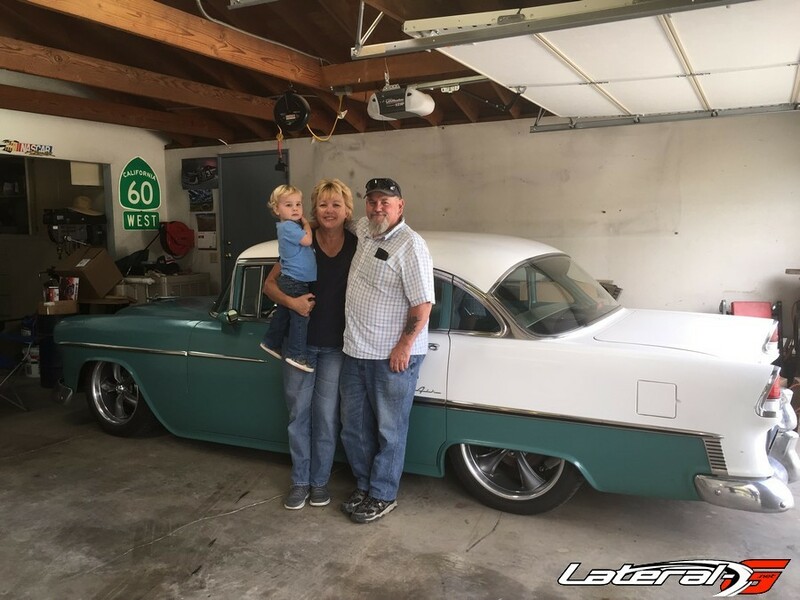 Naturally he has a list of things he wants to do on the car, air conditioning, new interior, etc…but for now, he’s just super happy to have a ‘55 again. I just wanted to say that I’m happy to that I was able to make my Dad’s dream come true. The look and expression on his face was priceless. After almost losing him a few years back, it was great to make him this happy and show some appreciation towards everything he did for me growing up.